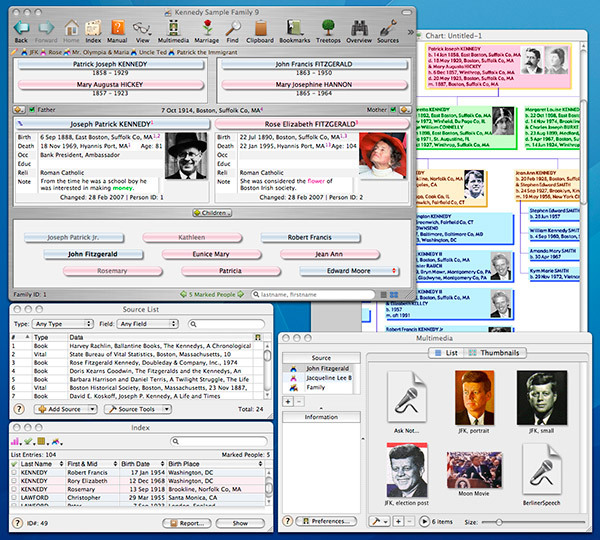 – Family Tree Magazine – Apple Picking (July 2008) (Version 9): Best for: Users migrating from full-featured Windows programs such as Family Tree Maker or RootsMagic. This full-featured program will look and feel familiar to anyone who’s used Windows genealogy software. * Snow Leopard (Mac OS 10.6) – fixed cosmetic glitch that appeared in some lists. * GEDCOM Import – fixed a problem introduced in Reunion 9.0a that prevented structured source fields from being imported properly. ( Charts – fixed display and printing issues with graphic images on charts. * Snow Leopard (Mac OS 10.6) – fixed an incompatibility with Reunion and Snow Leopard where family files would not open if they had source citations visible on the family card. Also fixed the display of source citations in note fields. * Snow Leopard (Mac OS 10.6) – fixed an incompatibility with Reunion and Snow Leopard when compacting family files while displaying children and parents in the list format. * iDisk/MobileMe – fixed some problems when uploading web reports to iDisk. * iDisk/MobileMe – replaced references to .mac (dot mac) with MobileMe. * Sorting Children – when sorting children on the family card, the modified date for the family card will be updated. * Printing – improved printing quality of PDF objects pasted in charts. * Web Reports – fixed a problem on Intel Macs when generating Google Analytics code. * LDS – fixed a bug when applying temple date and code to marked people. * LDS/GEDCOM Import – submitted status of LDS events will no longer be lost if a date is present. * Manual – several improvements in the manual. * Web Styles – several improvements to .css files.